This basket would display beautifully just about anywhere, either filled with flower petals or empty. Size: 10-3/4" Tall, 8-1/4" Wide at the basket, 4-7/8" Wide at Base. Weight of the crystal piece itself: 2lbs, 12 ozs. SHANNON Lead Clear Cut 24% Poland Made CRYSTAL Serving Basket. SHANNON CRYSTAL DESIGNS OF IRELAND BASKET CENTERPIECE MADE IN POLAND. Hand crafted crystal China. Great condition. No cracks or chip. It's was my wedding gift. Open box. Shipped with USPS Priority Mail. For your consideration is a Shannon Crystals Designs of Ireland Godinger Crystal Cut Glass Handled Basket. This lovely large basket has a manufacturer bubble at the top center edge which has an overlap of glass extending downward with inner glass crackling stemming outward within the glass. 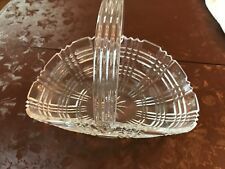 Shannon Crystal by Godinger Cut Glass Handled Basket Nantucket #15820 NEW w/ Box 00600. Condition: New with box. Original box has shelf wear. 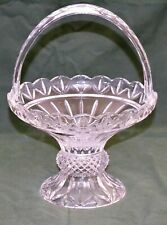 Grape Design hand cut crystal basket (24% Lead Crystal) from Shannon crystal by Godinger made in Poland In late 1900’s. Most everything is retired or sold cheaper here. So this has never been owned, just sitting in storage on a shelf. A Handled Basket Olympia by Godinger 24% Lead Crystal Made in Poland Height 11" to top of handle and 8 1/4" width Very Beautiful. Godinger 24% Cut Crystal Basket By Shannon,12" long 8.5" high.New In original Box. This stunning basket is Shannon Crystal by Godinger. It sports a lovely hand cut handle with detailed, frosted leaves. The handle has smooth beveled edges. The body of the basket has an open fan edge with curved spaces between each fan. This piece was my mom' s and is perfect and signed. 12 spoke Irish Crystal Basket.